http://www.1stclassmovingmn.com is owned and operated by 1st Class Moving Inc, Las Vegas, Nevada. Copyright © 2018 1st Class Moving Inc. ALL RIGHTS RESERVED. Unless otherwise indicated, this web site and its design, text, content, selection and arrangement of elements, organization, graphics, design, compilation, magnetic translation, digital conversion and other matters related to this web site are protected under applicable copyrights, trademarks and other proprietary (including, but not limited to, intellectual property) rights and are the property of 1st Class Moving Inc or the material is included with the permission of the rights owner and is protected pursuant to copyright and trademark laws. ALL RIGHTS RESERVED. 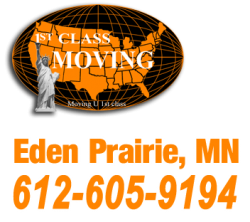 The 1st Class Moving logo, all product names, all page headers, all custom graphics, all button icons, all trademarks, service marks and logos appearing on this web site, unless otherwise noted, are service marks, trademarks (whether registered or not) and/or trade dress of 1st Class Moving (the “Marks”). All other trademarks, product names, company names, logos, service marks and/or trade dress mentioned, displayed, cited or otherwise indicated on the web site are the property of their respective owners. You agree not to display or use the Marks in any manner without our prior written permission. You agree not to display or use trademarks, product names, company names, logos, service marks and/or trade dress of other owners without the prior written permission of such owners. The use or misuse of the Marks or other trademarks, product names, company names, logos, service marks and/or trade dress or any other materials contained herein, except as permitted herein, is expressly prohibited. This web site may contain links and/or advertisements to other web sites maintained by us in addition to links to web sites maintained by unrelated companies and persons. An advertisement of, or link to, a non- 1st Class Moving web site does not mean that we approve, endorse or accept any responsibility for that web site, its content or use, or the use of products and services made available through such web site. We hereby give authorization to link to this web site. Such authorization is given without assumption of any liability by us relating to such links, and we hereby disclaim any such liability. We reserve the right to withdraw any authorization to link to this web site at any time and for any reason. Persons providing access to this web site via link from another web site are solely responsible for the content, accuracy, opinions expressed, privacy policies, products or services of, or available through, the source web site and for any representations made or impressions created concerning 1st Class Moving. WE MAKE NO REPRESENTATIONS OR WARRANTIES WITH RESPECT TO THIS WEB SITE OR ITS CONTENTS, WHICH ARE PROVIDED FOR USE “AS IS.” WE DISCLAIM ALL WARRANTIES, EXPRESS OR IMPLIED, INCLUDING WITHOUT LIMITATION THE IMPLIED WARRANTIES OF TITLE, NON-INFRINGEMENT, MERCHANTABILITY, QUALITY AND FITNESS FOR A PARTICULAR PURPOSE, WITH RESPECT TO THIS WEB SITE AND ANY WEB SITE WITH WHICH IT IS LINKED. WE DO NOT WARRANT THAT THIS web site, ITS SERVERS OR E-MAIL SENT FROM US WILL BE FREE OF ANY HARMFUL COMPONENTS (INCLUDING VIRUSES). WE ALSO MAKE NO REPRESENTATIONS OR WARRANTIES AS TO WHETHER THE INFORMATION ACCESSIBLE VIA THIS WEB SITE, OR ANY WEB SITE WITH WHICH IT IS LINKED, IS ACCURATE, COMPLETE, OR CURRENT. YOU ACCEPT THAT OUR SHAREHOLDERS, OWNERS, OFFICERS, DIRECTORS, EMPLOYEES AND OTHER REPRESENTATIVES SHALL HAVE THE BENEFIT OF THIS CLAUSE. The information and all other materials on this web site are provided for general information purposes only and do not constitute professional advice. It is your responsibility to evaluate (or take professional advice on) the accuracy and completeness of all information, statements, opinions and other material on this web site or any web site with which it is linked. To the fullest extent permitted by applicable laws we, on behalf of our employees, agents, suppliers, and contractors exclude liability for any losses and expenses of whatever nature and howsoever arising including, without limitation, any direct, indirect, special, punitive, or consequential damages, loss of use, loss of data, loss caused by a virus, loss of income or profit, loss of or damage to property, claims of third parties, or other losses of any kind or character, even if we have been advised of the possibility of such damages or losses, arising out of or in connection with the use of this web site or any web site with which it is linked. You assume total responsibility for establishing such procedures for data back up and virus checking as you consider necessary. You are responsible for providing and maintaining all personal computer and communications equipment and Internet access accounts necessary to gain access to this web site. In consideration of your use of the web site, you agree to provide true, accurate, current and complete information about yourself. You agree to use the web site in a manner consistent with any and all applicable laws, rules and regulations. You agree not to upload or transmit through the web site any computer viruses, trojan horses, worms or anything else designed to interfere with, interrupt or disrupt the normal operating procedures of a computer. You agree that the Federal Courts of the United States of America shall have exclusive jurisdiction to resolve any federal controversy or claim of whatever nature arising out of or relating to use of this web site, and that the laws of the United State shall govern such dispute or claim. You also agree that the courts of the State of Nevada shall have exclusive jurisdiction to resolve any non-federal controversy or claim of whatever nature arising out of or relating to use of this web site, and that the laws of the State of Nevada shall govern such dispute or claim, and that all non-federal court cases will be filed, processed, and handled in Las Vegas, Nevada unless otherwise directed by the court. However, we retain the right to bring legal proceedings in any jurisdiction where we believe that infringement of this agreement is taking place or originating.